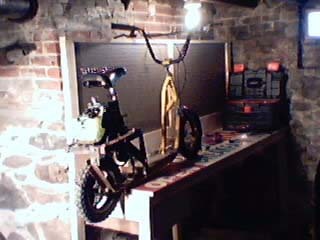 Took me about 20 hours over a weekend to put together once I had the parts. 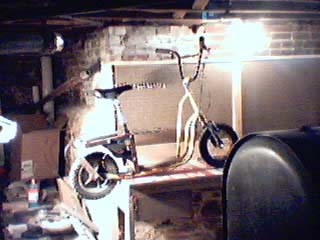 This is our second scooter we have put out only this time it came out much better. 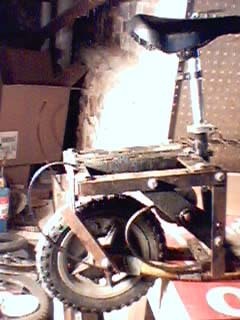 It kind of an ugly duck but hey it works, and with a max speed of 37 mph we werent complaining. Me (Matt, or MattyB) and my fellow racer (Casey, or Casey_L) were actually quite happy with it at first. Then it started falling apart. 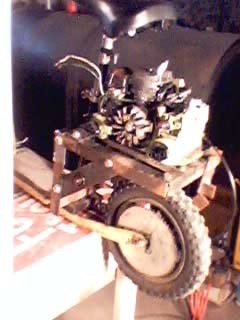 It was made from the same 40cc Poulan Wild Thing as the Prototype 1 Build 1 only now we have our gear ratio's straight. 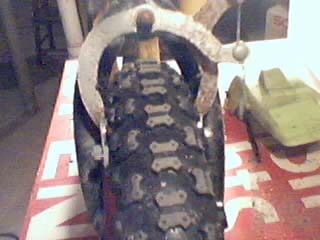 My first big mistake was that I Used a dual chain drive which is a bad idea and you shouldn't do it. 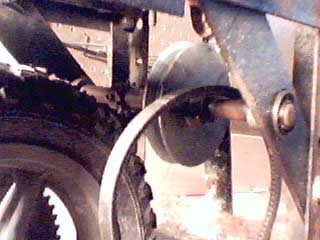 I oiled the chain everyday, but there was nothing I could do about it, the the sprocket on the shaft of my engine wore down to a perfect circle. So I headed to the hardware store. 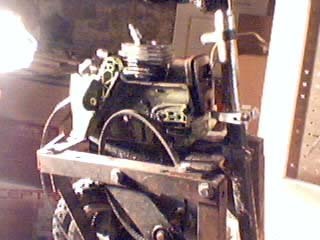 I found a 3 inch pulley with a 5/8 inch bore for the jackshaft, and a 1 inch with a 3/8 inch bore for the shaft of my engine. 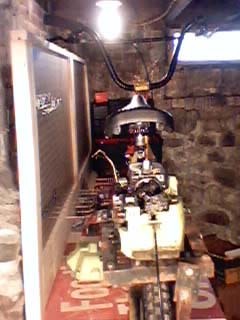 It took me about an hour to get it all changed up because my bearing were stuck on my jackshaft from rust. It started with a ratio of 9:1 and it was quite peppy, but I wanted more accel, more "get-go." So I headed back to the store and picked up a 4 inch V-Belt pulley and slapped that on in about 15 minutes. WHOAH! That thing took off and was up to top speed in no time. It maxed out at about 32 but I didnt care it was so much more fun to get in and out of corners, and the accel was amazing. I was much more happy with it. I was even able to some motocross style 180's on the dirt road next to my house. Then the engine started revving to extremly high rpm's, and i wasnt going anywhere. My belt had worn down so it wasn't getting any grip. Of course this was after about 4 hours of motocross on my road but it wasn't dependable enough for me. 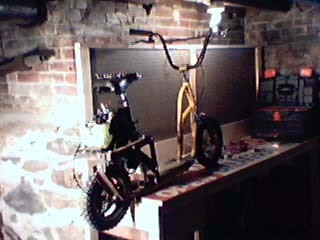 I wanted something that would last for a long period of beating on it with burnouts, and jumps. In these pictures it is not totally put together because they were taken after it became unusable. It had just been sitting around in my garage and i decided to put it on TZI's. 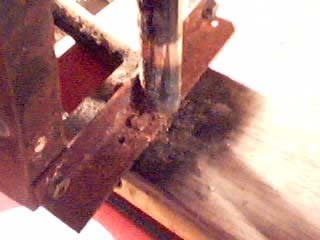 So It is not it working condition, not even bolted together. Note: This is a good method if you plan to just ride around town, but for me it isn't good enough.